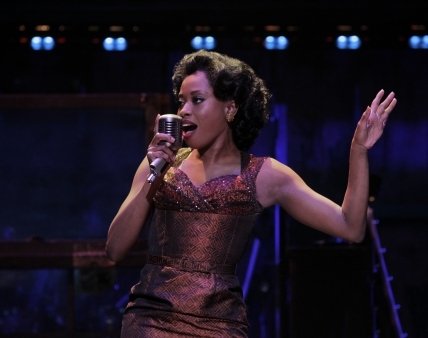 Felicia Boswell (Felicia) in the National Tour of MEMPHIS. Photo by Paul Kolnik. However long you’ve been singing for and however good you are, it’s challenging to go from being an amateur singer to being a professional. The good news is you don’t need to be world famous to be able to call yourself a professional singer. In addition to recording artists, different types of professional singer include those who work on cruise ships, sing in bars, clubs and lounges or perform in musical theatre. Although you don’t need a formal education to become a singer, it’s worthwhile enrolling in voice lessons if you happen to be at college and your school offers a voice course. You receive credit hours for taking the course while getting the chance to hone your craft. If you aren’t at college, consider taking private lessons with a singing tutor. Even if you’re already an experienced singer, getting tutored by a professional singer can give you the guidance and insight you need to become a professional yourself. Joining a band, choir or ensemble group can help you to get both practice and exposure as a singer. During rehearsals you’ll be exercising your vocal chords and practicing a set repertoire of songs regularly, giving you more experience and confidence as a singer. During public performances, you’ll be showcasing your singing talents in front of live audiences. Taking part in a singing group will also introduce you to other singers and musicians. You can offer support to one another as you look to progress in your respective careers. In the early stages of your singing career, getting a mentor can help you to achieve your goals. Find someone who’s had professional success themselves or who’s worked with other talented singers and ask them to mentor you. Whether they’re a professional singer, a voice tutor or a more experienced band mate, your mentor can encourage you and give you advice on making it in the music industry. When you’re starting out as a singer, the best way to get auditions for singing gigs is to attend open casting calls. These are auditions that you can just turn up to without an invitation. To make a good impression at an audition, spend some time beforehand putting together a portfolio of songs you’re willing to perform that highlight your vocal strengths. Also take along your resume and a headshot of yourself to the audition. Before you start singing, ask the musician who’ll be accompanying you on the guitar or the piano to read through the song first. If you’re planning on getting noticed as a singer by record companies or music producers, you’ll need to send them an audio recording of your singing. Such a recording is known as a demo tape. To make a good impression, your demo has to be of excellent sound quality so be sure to use high quality recording equipment when making the tape. When picking a song to record, choose one that has already been a big hit for other artists or that you feel has potential to become a big hit. When choosing record labels or music producers to send your demo to, research them thoroughly to make sure they are legitimate companies or professionals. There’s no guarantee that you’ll make it as a professional singer. Think of all the people in the world who are pursuing the same dream as you. Only a fraction will make it. However, if you have the drive, talent, passion and commitment to follow your dream, who knows how many people will be paying to see you perform or downloading your album from iTunes in a few years’ time?